The more I write, the more I learn. After leaving academia (as a monetary profession), I publish most of my writings through blogs. Rodriguez, M.A., “The Von Gremlin Architecture,” DataStax Blog, August 2017. Aliev, A., Rodriguez, M.A., “Reducing Computational Complexity with Correlate Traversals,” DataStax Blog, April 2017. Rodriguez, M.A., “Graphoendodonticology,” DataStax Blog, March 2017. Rodriguez, M.A., “A Gremlin Implementation of the Gremlin Traversal Machine,” DataStax Engineering Blog, October 2016. Rodriguez, M.A., “Gremlin’s Time Machine,” DataStax Engineering Blog, September 2016. Rodriguez, M.A., “The Mechanics of Gremlin OLAP,” DataStax Engineering Blog, April 2016. Rodriguez, M.A., Kuppitz, D., “The Benefits of the Gremlin Graph Traversal Machine,” DataStax Engineering Blog, September 2015. Rodriguez, M.A., Kuppitz, D., Yim, K., “Tales from the TinkerPop,” DataStax Engineering Blog, July 2015. Rodriguez, M.A., “Models of Computing in Semantic Networks,” University of California at Santa Cruz Doctoral Thesis, Computer Science Department, November 2007. Rodriguez, M.A., “Advances Towards a Societal-Scale Decision Support System,” University of California at Santa Cruz Masters Thesis, Computing Science Department, June 2004. Rodriguez, M.A., “Monkey Space Colony 6,” University of California at San Diego Senior Thesis, Interdisciplinary Computing and the Arts, Computer Music, May 2000. Rodriguez, M.A., Neubauer, P., “The Graph Traversal Pattern,” Graph Data Management: Techniques and Applications, eds. S. Sakr, E. Pardede, IGI Global, ISBN:9781613500538, August 2011. Rodriguez, M.A., “Interpretations of the Web of Data,” Data Management in the Semantic Web, eds. H. Jin and Z. Lv, series: Distributed, Cluster and Grid Computing, pp. 1-37, Nova Publishing, LA-UR-09-03344, ISBN:978-1-61324-760-0, 2011. Rodriguez, M.A., “General-Purpose Computing on a Semantic Network Substrate,” Emergent Web Intelligence: Advanced Semantic Technologies, Advanced Information and Knowledge Processing series, eds. R. Chbeir, A. Hassanien, A. Abraham, and Y. Badr, Springer-Verlag, LA-UR-07-2885, pages 57-104, ISBN:978-1-84996-076-2, June 2010. Rodriguez, M.A., Pepe, A., Shinavier, J., “The Dilated Triple,” Emergent Web Intelligence: Advanced Semantic Technologies, Advanced Information and Knowledge Processing series, eds. R. Chbeir, A. Hassanien, A. Abraham, and Y. Badr, Springer-Verlag, LA-UR-08-03927, pages 3-16, ISBN:978-1-84996-076-2, June 2010. Intelligence: Evolution of the Web in Artificial Intelligence Environments, eds. R. Nayak, N. Ichalkaranje, and L.C. Jain, Springer-Verlag, doi:10.1007/978-3-540-79140-9_11, LA-UR-07-2028, ISBN:978-3-540-79139-3, pages 245-279, 2008. Rodriguez, M.A., “A Collectively Generated Model of the World,” Collective Intelligence: Creating a Prosperous World at Peace, eds. M. Tovey, pages 261-264, EIN Press, ISBN:09715-6616X, Oakton, Virgina, April 2008. Rodriguez, M.A., “Stream Ring Theory,” S/V Red Herring’s Ship’s Log: Chronicles in the Sea of Cortez, pages 10-40, Mulege, Baja California Sur, Mexico, doi:10.5281/zenodo.2565243, February 2019. Rodriguez, M.A., Mallette, S., “The Graph Traversal Machine: Close Encounters of the Fourth Kind,” S/V Red Herring’s Ship’s Log: Chronicles in the Sea of Cortez, pages 1-10, La Paz, Baja California Sur, Mexico, doi:10.5281/zenodo.1476234, October 2018. Rodriguez, M.A., “Open Problems in the Universal Graph Theory,” Proceedings of GraphDay ’17, pages 1-5, San Francisco, California, doi:10.5281/zenodo.583293, June 2017. Rodriguez, M.A., Watkins, J.H., “Quantum Walks with Gremlin,” Proceedings of GraphDay ’16, LA-UR-15-29103, pages 1-16, Austin, Texas, January 2016. Rodriguez, M.A., “The Gremlin Graph Traversal Machine and Language,” Proceedings of the 15th Symposium on Database Programming Languages (DBPL 2015), pages 1–10, ISBN:978-1-4503-3902-5, doi:10.1145/2815072.2815073, ACM, October 2015. Powell, J., Shankar, H., Rodriguez, M.A., Van de Sompel, H., “EgoSystem: Where are our Alumni?,” Code4Lib, issue 24, ISSN:1940-5758, April 2014. Rodriguez, M.A., “The RDF Virtual Machine,” Knowledge-Based Systems, volume 24, issue 6, pages 890-903, ISSN:0950-7051, doi:10.1016/j.knosys.2011.04.004, LA-UR-08-03925, Elsevier, August 2011. Rodriguez, M.A., Neubauer, P., “A Path Algebra for Multi-Relational Graphs,” 2nd International Workshop on Graph Data Management (GDM’11), International Conference on Data Engineering Proceedings, pages 128-131, doi:10.1109/ICDEW.2011.5767613, IEEE, Hannover, Germany, April 2011. Rodriguez, M.A., Neubauer, P., “Constructions from Dots and Lines,” Bulletin of the American Society for Information Science and Technology, American Society for Information Science and Technology, volume 36, number 6, pages 35-41, doi:10.1002/bult.2010.1720360610, ISSN:1550-8366, August 2010. Rodriguez, M.A., Watkins, J.H., “Grammar-Based Geodesics in Semantic Networks,” Knowledge-Based Systems, volume 23, number 8, pages 844-855, doi:10.1016/j.knosys.2010.05.009, ISSN:0950-7051, LA-UR-07-4042, Elsevier, December 2010. Pepe, A., Rodriguez, M.A., “Collaboration in Sensor Network Research: An In-Depth Longitudinal Analysis of Assortative Mixing Patterns,” Scientometrics, volume 84, number 3, pages 687-701, doi:10.1007/s11192-009-0147-2, ISSN:0138-9130, LA-UR-09-06291, Springer, September 2010. Ham, M.I., Gintautas, V., Rodriguez, M.A., Bennett, R.A., Santa Maria, C.L., Bettencourt, L.M.A., “Density-Dependence of Functional Development in Spiking Cortical Networks Grown in Vitro,” Biological Cybernetics, volume 102, number 1, pages 71-80, doi:10.1007/s00422-009-0351-4, ISSN:0340-1200, LA-UR-08-04781, Springer, March 2010. Ham, M.I., Rodriguez, M.A., “A Boundary Approximation Algorithm for Distributed Sensor Networks,” International Journal of Sensor Networks, volume 8, number 1, pages 41-46, ISSN:1748-1279, LA-UR-09-00111, Inderscience Publishers, 2010. Rodriguez, M.A., Watkins, J.H., “Revisiting the Age of Enlightenment from a Collective Decision Making Systems Perspective,” First Monday, volume 14, number 8, ISSN:1396-0466, LA-UR-09-00324, University of Illinois at Chicago Library, August 2009. Rodriguez, M.A., “A Reflection on the Structure and Process of the Web of Data,” Bulletin of the American Society for Information Science and Technology, volume 35, number 6, pages 38-43, American Society for Information Science and Technology, doi:10.1002/bult.2009.1720350611, ISSN:1550-8366, LA-UR-09-03724, August 2009. Rodriguez M.A., Shinavier, J., “Exposing Multi-Relational Networks to Single-Relational Network Analysis Algorithms,” Journal of Informetrics, volume 4, number 1, pages 29-41, ISSN:1751-1577, Elsevier, doi:10.1016/j.joi.2009.06.004, LA-UR-08-03931, December 2009. Rodriguez, M.A., Watkins, J., “Faith in the Algorithm, Part 2: Computational Eudaemonics,” Proceedings of the International Conference on Knowledge-Based and Intelligent Information & Engineering Systems, Invited Session: Innovations in Intelligent Systems, eds. Velásquez, J.D., Howlett, R.J., and Jain, L.C., Lecture Notes in Artificial Intelligence, volume 5712, pages 813-820, doi:10.1007/978-3-642-04592-9_101, Springer-Verlag, LA-UR-09-02095, Santiago, Chile, ISBN:978-3-642-04591-2, April 2009. Rodriguez, M.A., Pepe, A., “Faith in the Algorithm, Part 1: Beyond the Turing Test,” Proceedings of the AISB Symposium on Computing and Philosophy, The Society for the Study of Artificial Intelligence and Simulation of Behaviour, LA-UR-09-00052, Edinburgh, Scotland, April 2009. Bollen, J., Van de Sompel, H., Hagberg, A., Bettencourt, L.M.A, Chute, R., Rodriguez, M.A., Balakireva, L.L., “Clickstream Data Yields High-Resolution Maps of Science,” PLoS One, Public Library of Science, volume 4, number 3, e4803, doi:10.1371/journal.pone.0004803, ISSN:1932-6203, March 2009. Rodriguez, M.A., Gintautas, V., Pepe, A., “A Grateful Dead Analysis: The Relationship Between Concert and Listening Behavior,” First Monday, volume 14, number 1, ISSN:1396-0466, LA-UR-08-04421, University of Illinois at Chicago Library, January 2009. Rodriguez, M.A., Geldart, J., “An Evidential Path Logic for Multi-Relational Networks,” Proceedings of the Association for the Advancement of Artificial Intelligence Spring Symposium: Technosocial Predictive Analytics Symposium, volume SS-09-09, pages 114-119, ISBN:978-1-57735-416-1, AAAI Press, LA-UR-08-06397, Stanford University, March 2009. Srinivasan, R., Pepe, A., Rodriguez, M.A., “A Clustering-Based Semi-Automated Technique to Build Cultural Ontologies,” Journal of the American Society for Information Science and Technology, volume 60, number 2, pages 1-13, doi:10.1002/asi.20998, ISSN:1532-2882, Wiley, January 2009. Rodriguez, M.A., Bollen, J., “An Algorithm to Determine Peer-Reviewers,” Conference on Information and Knowledge Management (CIKM), pages 319-328, doi:10.1145/1458082.1458127, ISBN:978-1-59593-991-3, LA-UR-06-2261, ACM Press, Napa Valley, California, October 2008. Rodriguez M.A., Bollen, J., Van de Sompel, H., “Automatic Metadata Generation using Associative Networks,” ACM Transactions on Information Systems, volume 27, number 2, pages 1-20, ISSN:1046-8188, ACM Press, doi:10.1145/1462198.1462199, LA-UR-06-3445, February 2009. Rodriguez, M.A., Pepe, A., “On the Relationship Between the Structural and Socioacademic Communities of a Coauthorship Network,” Journal of Informetrics, volume 2, number 3, pages 195-201, ISSN:1751-1577, doi:10.1016/j.joi.2008.04.002, Elsevier, LA-UR-07-8339, July 2008. Rodriguez, M.A., “Grammar-Based Random Walkers in Semantic Networks,” Knowledge-Based Systems, volume 21, number 7, pages 727-739, ISSN:0950-7051, Elsevier, doi:10.1016/j.knosys.2008.03.030, LA-UR-06-7791, October 2008. Bollen, J., Van de Sompel, H., Rodriguez, M.A., “Towards Usage-Based Impact Metrics: First Results from the MESUR Project,” Joint Conference on Digital Libraries (JCDL), ISBN:978-1-59593-998-2, ACM/IEEE Computing, doi:10.1145/1378889.1378928, Pittsburgh, Pennsylvania, June 2008. Rodriguez, M.A., “Mapping Semantic Networks to Undirected Networks,” International Journal of Applied Mathematics and Computer Sciences, volume 5, number 1, pages 39-42, ISSN:2070-3902, World Academy of Science Engineering and Technology, LA-UR-07-5287, 2009. Rodriguez, M.A., Watkins, J.H., Bollen, J., Gershenson, C., “Using RDF to Model the Structure and Process of Systems,” InterJournal of Complex Systems, 2131, ISSN:1081-0625, New England Complex Systems Institute, LAUR-07-5720, Boston, Massachusetts, February 2008. Dellavalle, R.P., Schilling, L.M., Rodriguez, M.A., Van de Sompel, H., Bollen, J., “Refining Dermatology Journal Impact Factors using PageRank,” Journal of the American Academy of Dermatology, volume 57, number 1, pages 116-119, doi:10.1016/j.jaad.2007.03.005, ISSN:0190-9622, Elsevier, July 2007. Rodriguez, M.A., Bollen, J., Van de Sompel, H., “A Practical Ontology for the Large-Scale Modeling of Scholarly Artifacts and their Usage,” Joint Conference on Digital Libraries (JCDL), pages 278-287, ACM/IEEE Computing, doi:10.1145/1255175.1255229, LA-UR-07-0665, Vancouver, Canada, June 2007. Rodriguez, M.A., “A Methodology for Studying Various Interpretations of the N,N-dimethyltryptamine-Induced Alternate Reality,” Journal of Scientific Exploration, volume 21, number 1, pages 67-84, Society for Scientific Exploration, ISSN:0892-3310, 2007. Rodriguez, M.A., “Social Decision Making with Multi-Relational Networks and Grammar-Based Particle Swarms,” Hawaii International Conference on Systems Science (HICSS), Track: Collaboration Technology – Social Cognition and Knowledge Creation Using Collaborative Technology, pages 39-49, Waikoloa, Hawaii, IEEE Computer Society, ISSN: 1530-1605, doi:10.1109/HICSS.2007.487, LA-UR-06-2139, January 2007. Rodriguez, M.A., Steinbock, D.J., Watkins, J.H., Gershenson, C., Bollen, J., Grey, V., deGraf, B., “Smartocracy: Social Networks for Collective Decision Making,” Hawaii International Conference on Systems Science (HICSS), Track: Electronic Government – E-Democracy, pages 90-100, Waikoloa, Hawaii, IEEE Computer Society, ISSN:1530-1605, doi:10.1109/HICSS.2007.484, LA-UR-06-2244, January 2007. Bollen, J., Rodriguez, M.A., Van de Sompel, H., “Journal Status,” Scientometrics, volume 69, number 3, pages 669-687, ISSN: 0138-9130, doi:10.1007/s11192-006-0176-z, Springer, LA-UR-05-6466, December 2006. Rodriguez, M.A., Bollen, J., Van de Sompel, H., “Mapping the Bid Behavior of Conference Referees,” Journal of Informetrics, volume 1, number 1, pages 62-82, ISSN:1751-1577, doi:10.1016/j.joi.2006.09.006, Elsevier, LA-UR-06-0749, January 2007. Rodriguez, M.A., Bollen, J., Van de Sompel, H., “The Convergence of Digital Libraries and the Peer-Review Process,” Journal of Information Science, volume 32, number 2, pages 149-159, ISSN:0165-5515, doi:10.1177/0165551506062327, Sage Publishing, LA-UR-05-6468, April 2006. Rodriguez, M.A., “A Multi-Relational Network to Support the Scholarly Communication Process,” International Journal of Public Information Systems, volume 2007, number 1, pages 13-29, ISSN:1653-4360, LA-UR-06-2416, Mid Sweden University, March 2007. Champion, B., Rodriguez, M.A., Blakeslee, J.H., Metcalf, S., “Postmodern Critique of Complexity Science,” Proceedings of the Santa Fe Institute Complex Systems Summer School, Santa Fe Institute, Santa Fe, New Mexico, July 2004. Weeks, B., Rodriguez, M.A., Blakeslee, J.H., “Panarchy: Complexity and Regime Change in Human Societies,” Proceedings of the Santa Fe Institute Complex Systems Summer School, Santa Fe Institute, Santa Fe, New Mexico, July 2004. Rodriguez, M.A., “Advances Towards a General-Purpose Human-Collective Problem-Solving Engine,” Proceedings of the International Conference on Systems, Man and Cybernetics, IEEE SMC, volume 1, pages 206-211, ISSN:1062-922X, doi:10.1109/ICSMC.2004.1398298, The Hague, Netherlands, 2004. Rodriguez, M.A., Steinbock, D.J., “A Social Network for Societal-Scale Decision-Making Systems,” Proceedings of the North American Association for Computational Social and Organizational Science Conference, Pittsburgh, Pennsylvania, 2004. Rodriguez, M.A., Steinbock, D.J., “Group Holographic Modeling for Societal-Scale Decision-Making Systems,” Proceedings of the North American Association for Computational Social and Organizational Science Conference, Pittsburgh, Pennsylvania, 2004. Rodriguez, M.A., “Using Java Agents to Make JBuilder a More Group-Centric IDE,” Proceedings of the Borland Conference (BorCon), San Jose, California, November 2003. Rodriguez, M.A., “A Distributed Process Infrastructure for a Distributed Data Structure,” Semantic Web and Information Systems Bulletin, AIS Special Interest Group on Semantic Web and Information Systems (SIGSEMIS), ISSN:1556-2301, LA-UR-08-04138, July 2008. York, S.A., Hellman, S.A., Wyatt, J., Rodriguez, M.A., Hill, S.H., “Methods and Systems for Network-Based Analysis, Intervention, and Anonymization,” Pearson Education and Aurelius, March 2018. Rodriguez, M.A., Steinbock, D.J., Watkins, J.H., “Social Semantic Networks for Distributing Contextualized Information,” Los Alamos National Laboratory and Stanford University, Patent Pending: LAD2006-115, December 2006. Rodriguez, M.A., Ham, M.I., Gintautas, V., Kunsberg, B.S., “A Prospectus on the Obstacles Inhibiting the Implementation of Advanced Artificial Neural Systems – Part 1,” Decade of Mind IV Conference, Albuquerque, New Mexico, January 2009. Ham, M.I., Rodriguez, M.A., Gintautas, V., Bennett, R., Santa Maria, C.L., Bettencourt L.M.A., “On the Relationship Between Neural Density and Functional Connectivity in the Murine Cortex,” Dynamic Days, San Diego, California, January 2009. Dellavalle, R.P., Schilling, L.M., Van de Sompel, H., Rodriguez, M.A., Bollen, J., “PageRank Adjustment of Dermatology Journal Impact Factor,” 2007 European Society for Dermatological Research, Zurich, Switzerland, September 2007. Bollen, J., Rodriguez, M.A., Van de Sompel, H., Balakireva, L.L., Hagberg, A., “The Largest Scholarly Semantic Network…Ever.,” 2007 ACM World Wide Web Conference, pages 1247-1248, ACM, Banff, Canada, LA-UR-07-0664, May 2007. Bollen, J., Rodriguez, M.A., Van de Sompel, H., “MESUR: Usage-Based Metrics of Scholarly Impact,” 2007 ACM/IEEE Joint Conference on Digital Libraries, pages 474-474, Vancouver, Canada, ACM/IEEE Computing, June 2007. 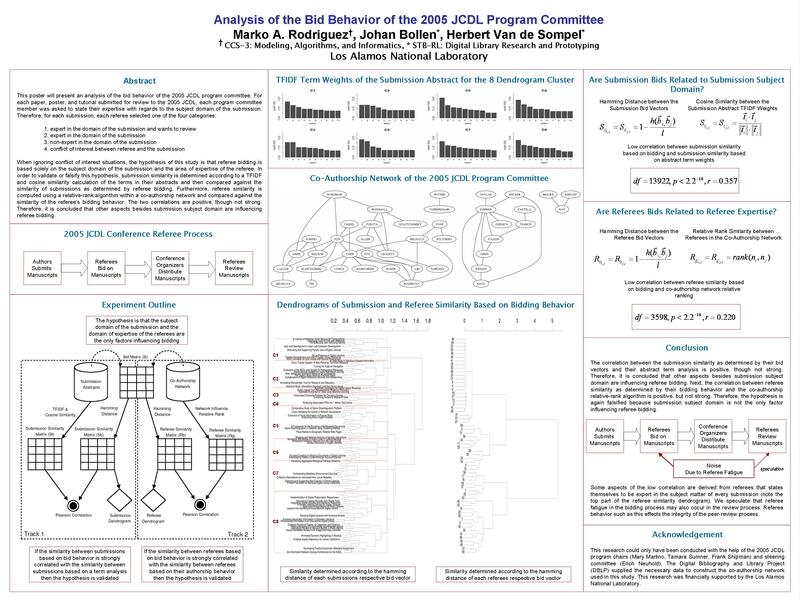 Rodriguez, M.A., Bollen, J., Van de Sompel, H., “An Analysis of the Bid Behavior of the 2005 JCDL Program Committee,” ACM/IEEE-CS 2006 Joint Conference on Digital Libraries, pages 352-352, North Carolina, USA, LA-UR-06-3864, June 2006. Rodriguez, M.A. Bollen, J., Van de Sompel, H., “Automatic Metadata Generation using Particle Swarms,” Los Alamos National Laboratory Division Review Committee, Los Alamos, New Mexico, USA, LA-UR-06-3281, May 2006. Rodriguez, M.A., “Software Engineering Agents,” Borland Conference, BorCon ’03 Poster, San Jose, California, USA, November 2003. Rodriguez, M.A., “Agents and Group-Centric Software Development,” Center for Information Technology Research in the Interest of Society, Santa Cruz, California, October 14-15, 2003. Watkins, J. H., Rodriguez, M. A., “Weak Links: Stabilizers of Complex Systems from Proteins to Social Networks,” written by Peter Csermely, Artificial Life, volume 13, number 2, pages 207-208, ISSN: 0024-3892, doi:10.1162/artl.2007.13.2.207, LAUR-06-7965, 2007. Rodriguez, M.A., “Nature’s Magic: Synergy in Evolution and the Fate of Humankind,” written by Peter Corning, Artificial Life, volume 12, number 4, pages 639-641, ISSN: 0024-3892, doi:10.1162/artl.2006.12.4.639, 2006. Rodriguez, M.A., Allen, D.W., Shinavier, J., Ebersole, G., “A Recommender System to Support the Scholarly Communication Process,” KRS-2009-02, April 2009. Rodriguez, M.A., “A Graph Analysis of the Linked Data Cloud,” KRS-2009-01, February 2009. Rodriguez, M.A., Bollen, J., “Modeling Computations in a Semantic Network,” LA-UR-07-3678, May 2007. Rodriguez, M.A., Watkins, J.H., Steinbock, D.J., “Social Networks for News Media Distribution,” Los Alamos National Laboratory Technical Report, LA-UR-06-2244, March 2005. Joslyn, C., Verspoor, K., Rodriguez, M.A., “Representing the M and I Semantic Space: Concept Description for Lexical Management in Support of Ontology Development,” Los Alamos National Laboratory Technical Report, LA-UR-06-1060, 2006. Rodriguez, M.A., Steinbock, D.J., “The Anatomy of a Large Scale Collective Decision Making System,” Los Alamos National Laboratory Technical Report, LA-UR-06-2139, March 2006. Rodriguez, M.A., Bollen, J., “Simulating Network Influence Algorithms Using Particle-Swarms: PageRank and PageRank-Priors,” Los Alamos National Laboratory Technical Report, LA-UR-05-6469, August 2005. Rodriguez, M.A., “The Hyper-Cortex of Human Collective-Intelligence Systems,” Center for Evolution Complexity and Cognition Working Paper 2004-06, June 2005. Steinbock, D., Kaplan, C., Rodriguez M.A., Diaz, J., Der, N., Garcia, S., “Collective Intelligence Quantified for Computer-Mediated Group Problem Solving,” University of California at Santa Cruz Technical Report, UCSC-CRL-02-28, July 2002.